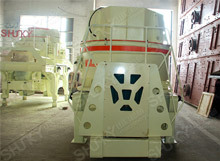 Impact Crusher of Shanghai ShunkyIs Praised By Customers For Many Years. Seven years ago, Shanghai Shunky received a notice of receiving Lebanese customers.The Lebanese customers visited the factory and was deeply touched by the speciality of technicist and the enthusiasm of sales staff .The customer not only praised the staffs, but also decided that the crushing equipment required by this project wasmade by Shunky. Till today, this customer has bought more than 10 Impact crushers from our company.The client said: we bought crushers several years ago. We have achieved great achievements in the crushing of construction waste and obtained considerable economic income.These impact crushers have been used for years now, and have not had any problems.The customer also said that he intended to expand production in the near future, and decided to order more large-output crushing equipment to increase the crushing strength of construction waste. Shanghai Shunky has professional production, research and development on various crushers.And also has strict requirements forequipment quality.We seek the maximum benefit for customers.The company will keep the good values,focus on the interests of customers, and produce the best crushersof the industry and word. 2018-11-08 Impact Crusher of Shanghai ShunkyIs Praised By Customers For Many Years.